Don’t you just love it when you feel like you’ve been HEARD? 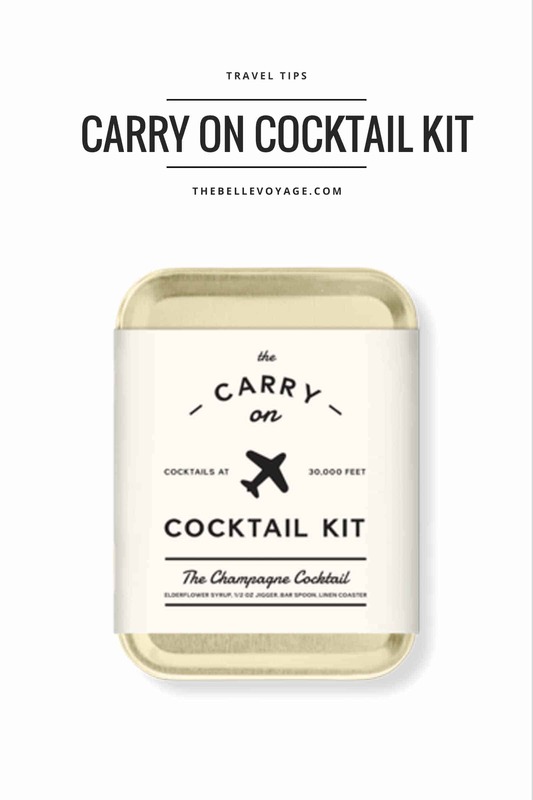 Remember a while back, when I talked about a cool new travel find: the Carry on Cocktail Kit? If you haven’t seen one of these yet, they’re basically a traveler’s dream – or at least the subset of travelers who enjoy an in-flight cocktail (in other words: my people). The kit has all the fixings you need (in TSA-approved portions) to leverage the in-flight beverage service and make a hand-crafted cocktail that can be enjoyed at 30,000 feet. Not to mention the curb appeal. The design puts the Carry on Cocktail Kit squarely in the category of Things I’d Buy Just Because They’re Cute (and miniature, if I’m being honest). Anyway, in my previous post, I was singing the praises of the Carry on Cocktail Kit…but there was one drawback. It only had one version: an Old Fashioned – which is not exactly my cup of cocktail. So at the end of the post, I was all: please call me when you make a champagne cocktail version, mmmmkay? I think you probably know where the story goes from here. 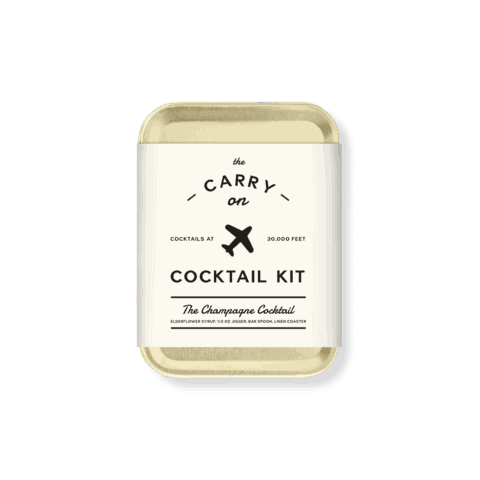 Yep – fast forward a bit, and lo and behold – the champagne version of the Carry on Cocktail Kit NOW LIVES. Check it out here. Champagne makes everything better, obviously, but if a champagne cocktail isn’t your thing, the kit also comes in two other “flavors”: a Moscow Mule and a G&T. 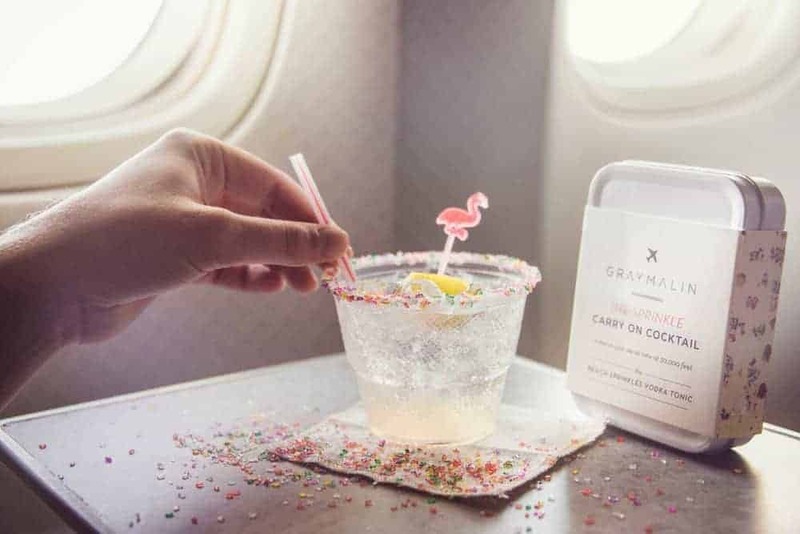 As an added bonus, there’s also a FIFTH version of the Carry On Cocktail Kit, available at Gray Malin: The SPRINKLE Carry On Cocktail Kit, which comes complete with a flamingo stirrer. YES and YES.